After receiving our smoker gift from our friend George, we immediately went on a hunt for big cuts of meat with big fat caps. 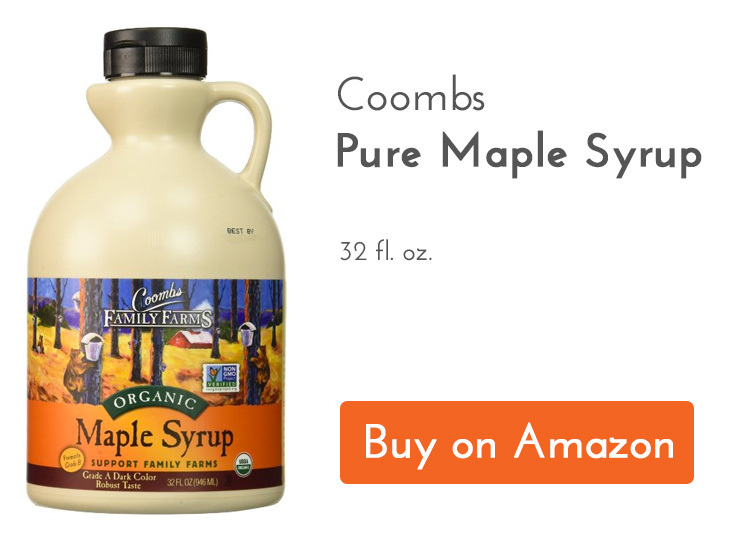 Every time we went to our local farmers market, the request was the same: “Got anything big with a lot of fat? 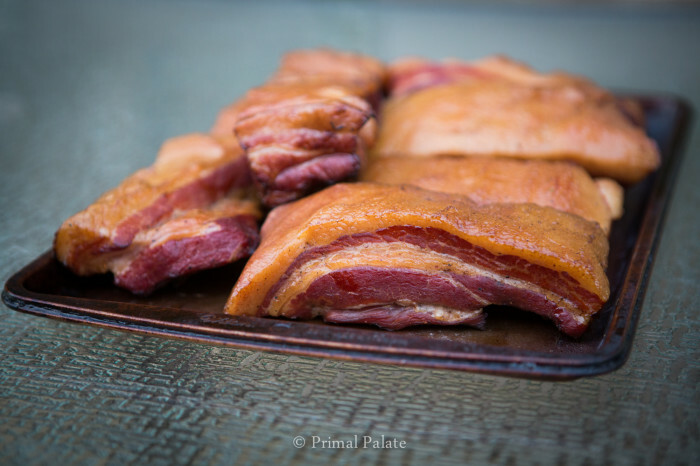 We need cuts of meat for our smoker.” A few weeks into our quest, we had a huge payoff: our favorite pig farmer had what she said was a whole pork belly. In fact, she said it might be around 30 lbs. I think my heart stopped for a moment. THIRTY POUNDS? Of course, the words were barely out of her mouth before I told her we’d take it. She would bring it to the farmers market the next week and that was that! Fast forward a week and we picked up this beautiful rolled up piece of pork belly. It actually turned out to be 13 lbs, not 30, but that was just fine for us. 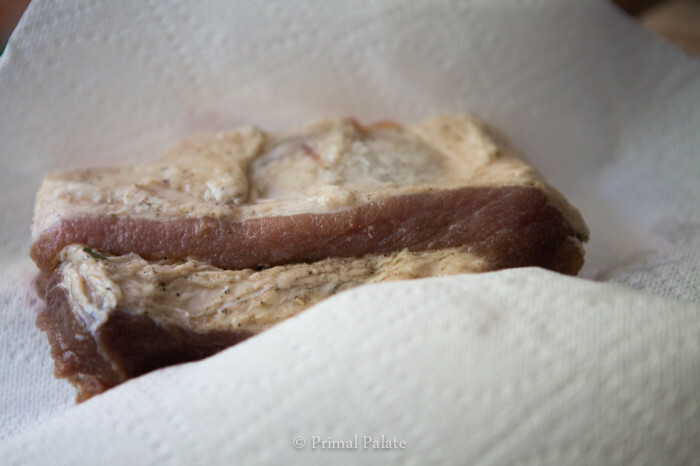 After having it in our freezer for a few days, the initial fear wore off and we were ready to tackle project “makin’ bacon.” The first step was to find a trustworthy recipe online, since we’d never actually cured pork belly like this before. 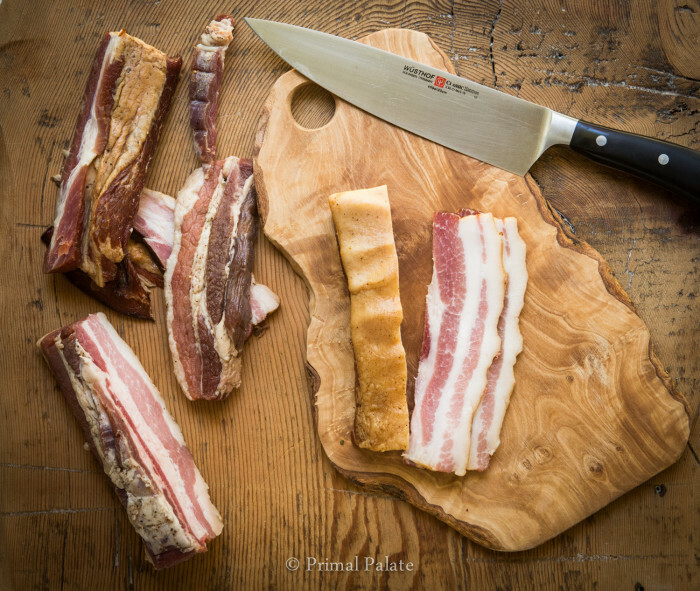 Fortunately, I had just chatted with Josh (aka Slim Palate) a few days earlier and knew he had used Michael Ruhlman’s recipe for bacon from his popular book Charcuterie to make bacon himself. Using Ruhlman’s recipe as a starting point seemed like a damn fine idea to me. Normally, I’d happily fuss with anyone else’s recipe quite a bit to fine tune it to my liking. Not with curing meat, though. 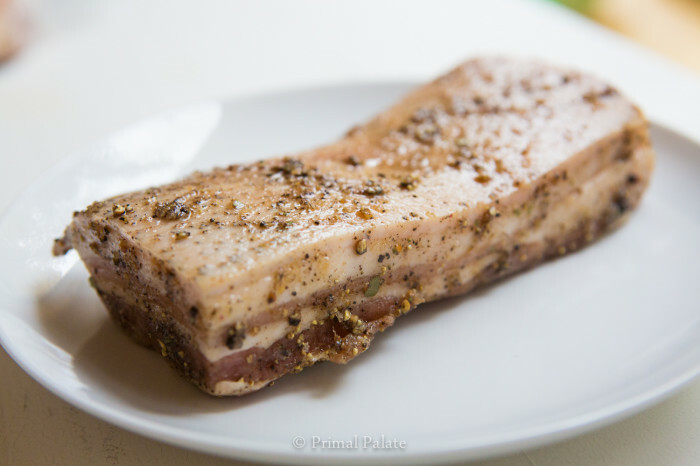 Some brief reading on the subject of curing pork belly informed me that the salt ratio is really important to get right for food safety concerns. 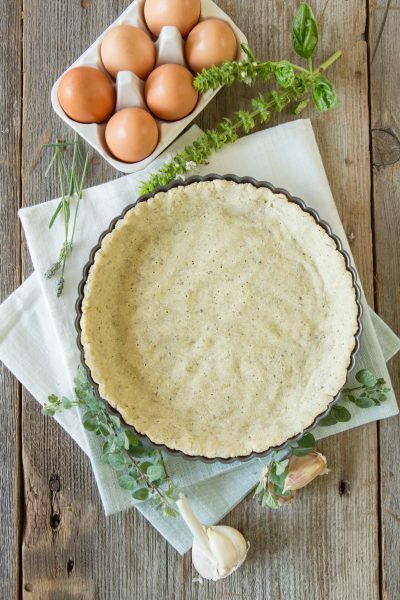 Therefore, other than some minor tweaks, this is really, really similar to Michael Ruhlman’s recipe. Just want to make that clear! First, we cut up the belly into approximately 1 lb chunks. Small pieces are easier to handle throughout the processing, so make some logical cuts. Also consider what will be easy to fit into your skillet. Our pieces are about 6-8″ long, and 4″ wide. This slices up nicely for frying. Mix up the salt and sugar rub evenly over each piece of belly, making sure to get even coverage. Since the salt ratio is important, it’s therefore also important to portion out the salt and sugar rub amongst all the pieces of pork belly you have. 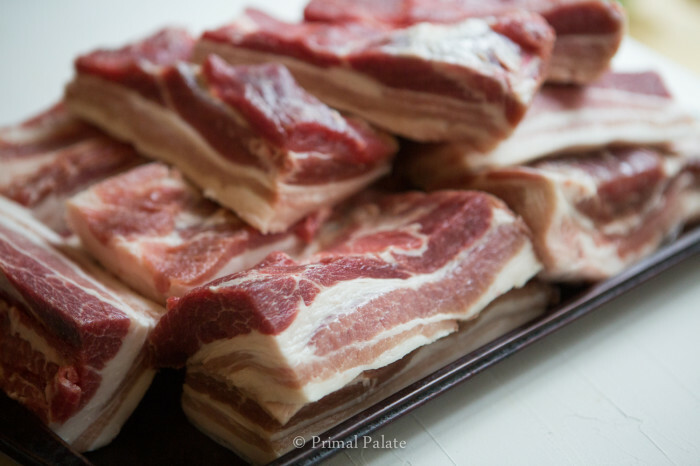 The pork belly is going to dry-cure for 7 days, sealed up in your refrigerator. Place several pieces of the belly in each resealable bag (use the ones from Target which are BPA-free, if that’s a concern). When closing, try to force out as much air as possible. Place all the sealed belly on a jelly roll pan, and place in your refrigerator for one week. After one week has passed, take the belly out of the refrigerator. 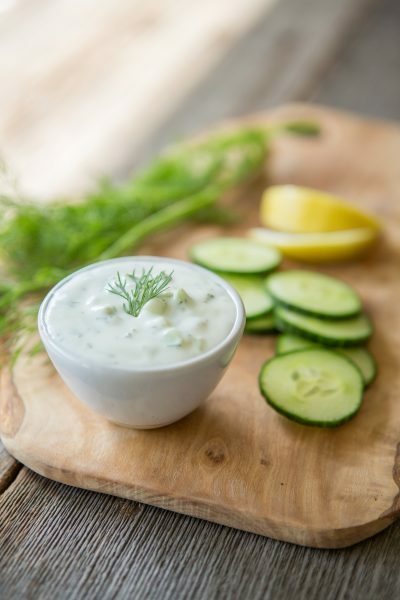 Rinse the belly, and try to remove as much of the dry cure as possible. Use your hands to “scrub” the belly under a steam of cold water. 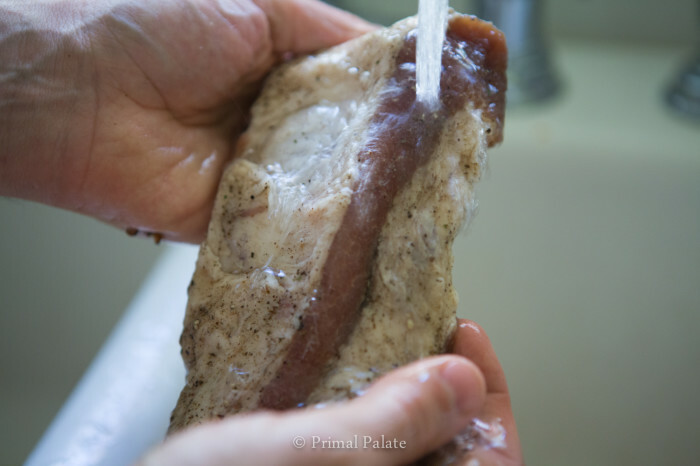 Pat the pork belly dry with paper towels. While drying the belly, fire up your smoker. If you don’t have a smoker, you can use your oven (but alas, you will miss out on the smoky flavor that is classic to bacon). Place the pork belly in the smoker. You should have it set to a low smoke setting (200-220 degrees), and smoke the belly for 2 hours. After 2 hours, your pork belly will be almost this delicious looking. This batch (above) went for 2.5 hours, and developed a very strong smoky flavor along with a darker color. Keep the smoking to 2 hours only – the second batch we did went 2 hours and it was better than the batch that went 2.5 hours. Ideally, what you really are looking for is an internal temperature of 150 degrees. 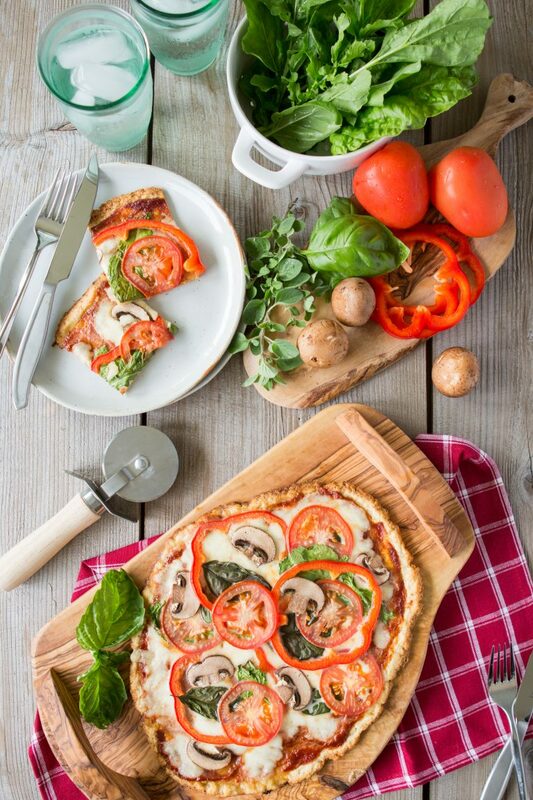 You can also cook the belly in your oven set to 200 degrees for 90 minutes. We tested that method as well and it worked just fine. The only shortcoming was the lack of smoky flavor. After allowing the bacon to firm up in the refrigerator over night, you’re ready to fry up some bacon! 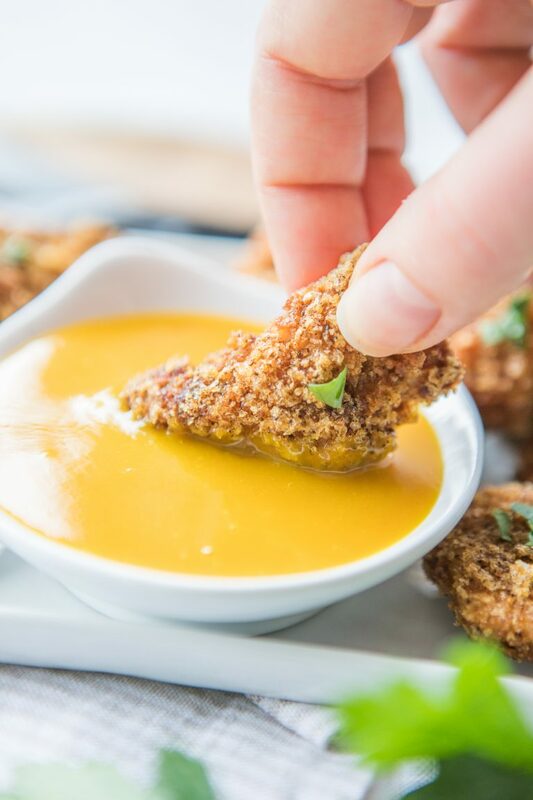 Fry it, eat it, and enjoy! 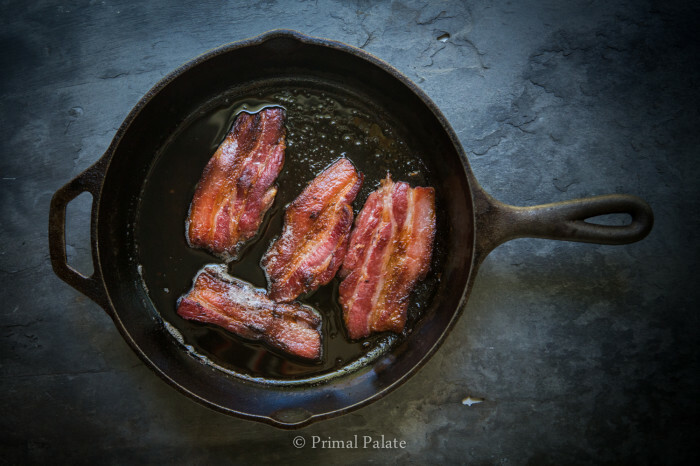 To cook it, we recommend placing the cool bacon in a cool cast iron skillet. 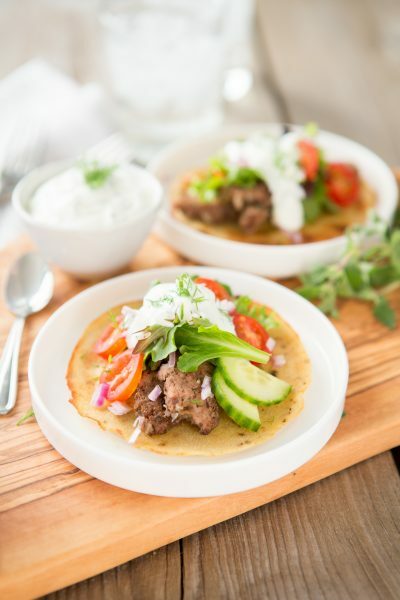 Cook it slowly over a medium low flame until it reaches its desired crispiness. 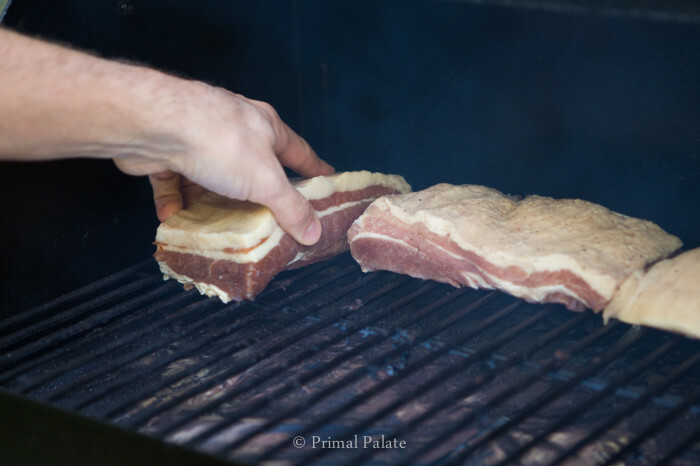 Curing your own pork belly at home to make bacon is easy! 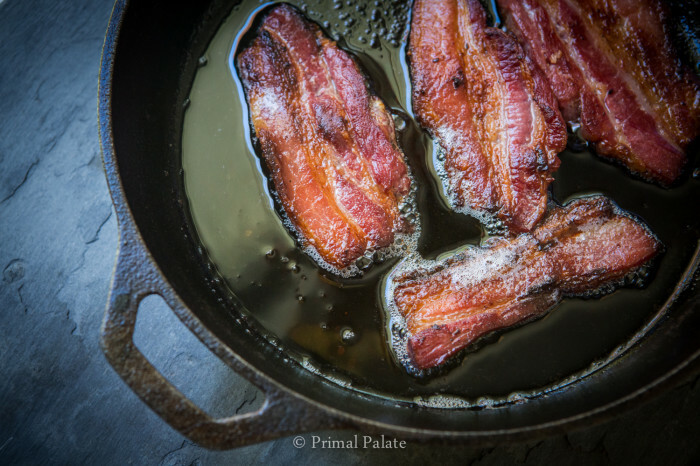 Just follow these simple instructions and you'll be frying up your own bacon in no time! The recipe below is adapted from Michael Ruhlman's recipe from his popular book, Charcuterie. 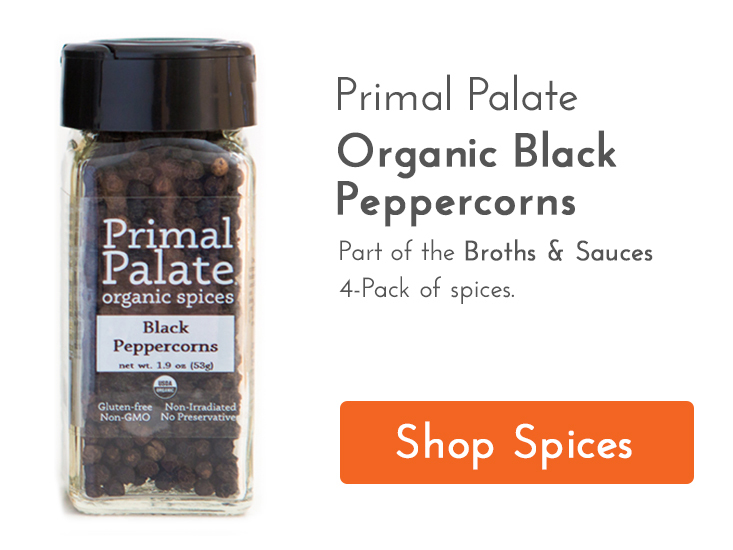 1/2 cup 1/2 cup 1/2 cup Black Pepper, eyeball it. we coarsely milled ours in our coffee grinder for a few seconds. 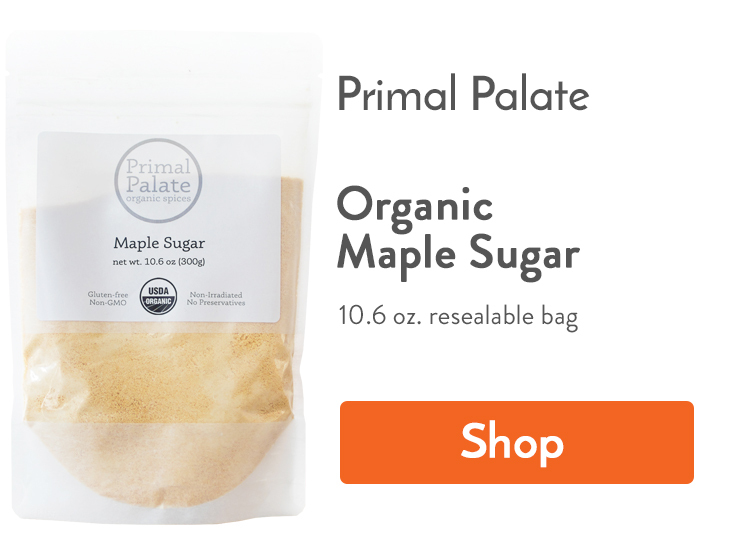 Combine salt, maple sugar, maple syrup, and spices together in a medium mixing bowl. 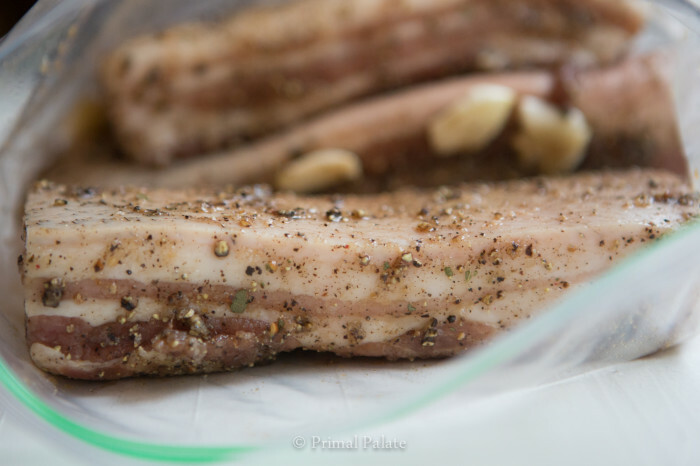 Rub mixture all over the pork belly, and place into ziploc bags, add in a clove of garlic for each pound of belly. After 7 days, remove the belly from the bags, and rinse the dry rub off under cold water. 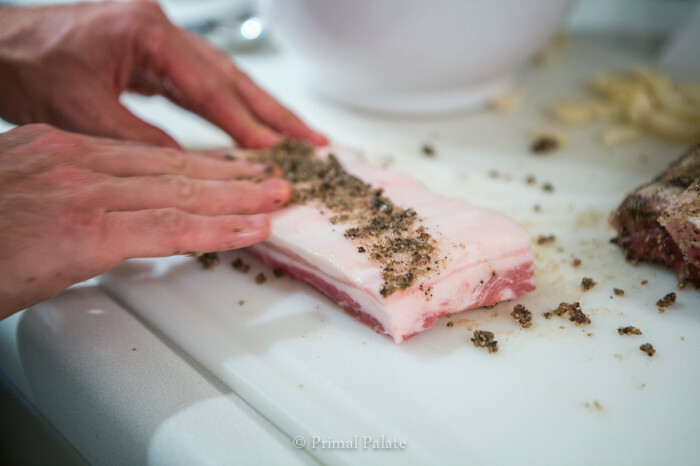 Pat the pork belly dry. Smoke the belly for 2 hours at 200-220 degrees. If you don't have a smoker, cook in an oven for 90 minutes at 200 degrees. Refrigerate for an additional 12 hours or freeze, then cook as you would any other bacon, and serve. 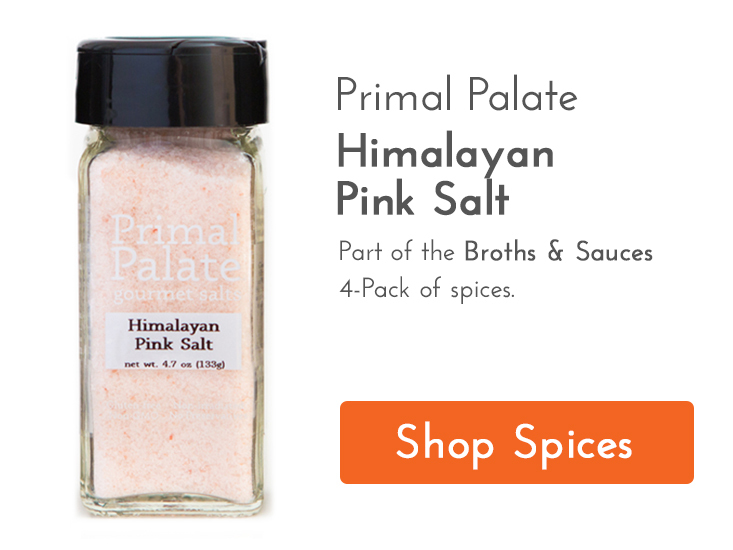 The pink salt or powdered celery juice is important for the nitrite content. 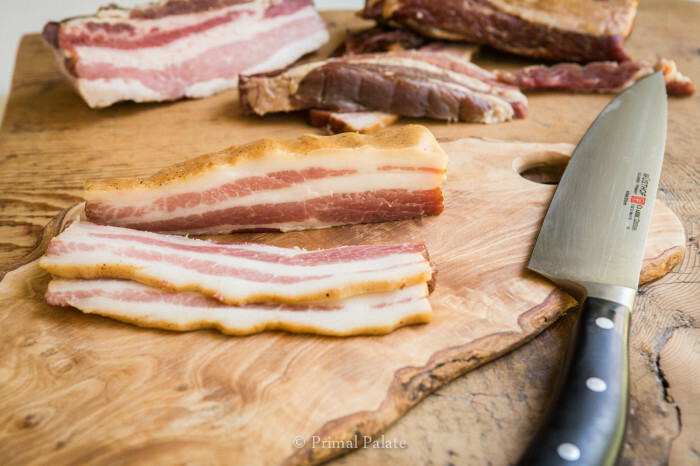 This not only keeps the bacon "safe" for consumption, but it also allows the bacon to keep it's beautiful red color while cooking. Fat renders at 160. Careful in smokers which might have more direct heat, which will cause the fat to render more. It is recommended to me by a Charcuterie wiz is to let the belly dry in the fridge for at least 16 hours after cure and before smoke. This helps to form a pellicle that allows for more smoke to adhere to the meat. I personally have done both smoke with and without the skin. I much prefer removing the skin after the smoke; its much easier, allows for smokey chiccarones or pork rinds if you have a frier or just a smokey transport for a soak in a soup (remove before eating). Thanks for the insight! I’ll definitely try those next time! I’ve been meaning to grab some belly to cure. This time of year might actually be ideal for cold smoking, when temps don’t typically climb out of the 20’s or 30s here. Our little pellet smoker doesn’t like the cold, but for cold smoking purposes it would be perfect. I’ll report back next time I cure a batch. Please note that basically all resealable bags are BPA free not just the Target brand. 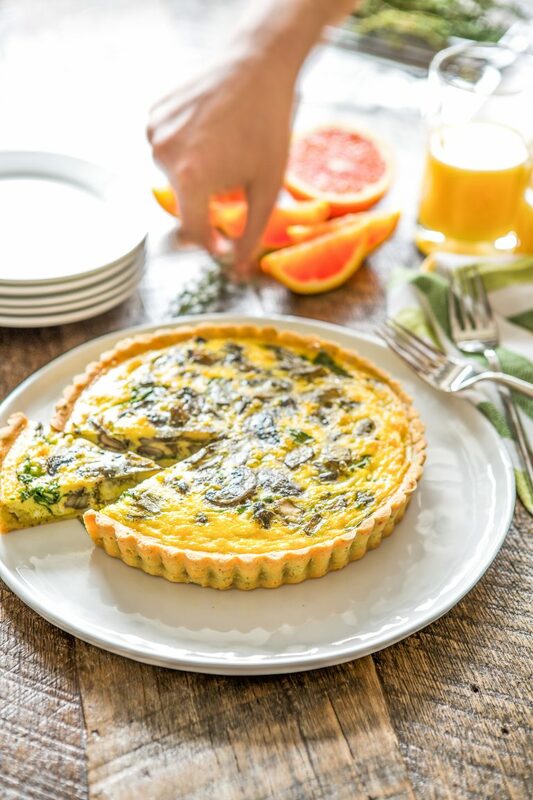 I’m on the AutoImmune Paleo elimination diet, so I have to keep my sugar intake to a minimum….do you think I could follow this recipe with the salt only (regular + curing salts)? 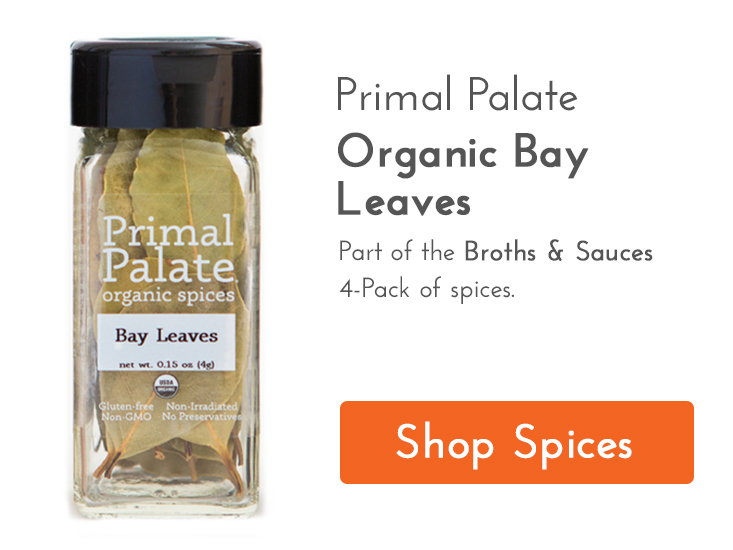 Or just the salts and pepper? Thanks! I have a daughter who can not eat cured meat. Nitrates gives her sever migraines. What would be the results if I omitted the pink salt and/or celery juice?